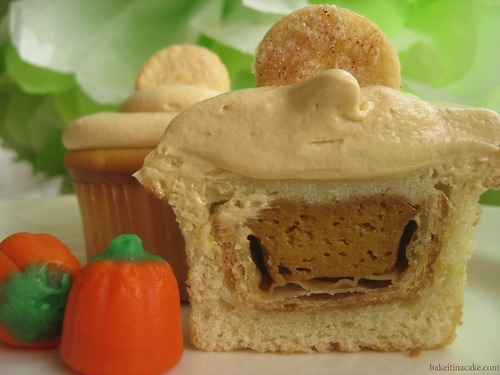 like this one filled with a mini pumpkin pie…. 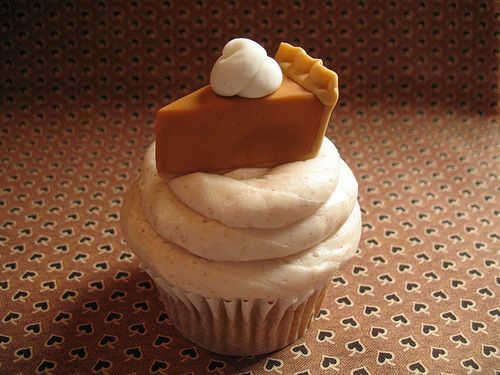 and this one with a perfect little pie sitting on top…. 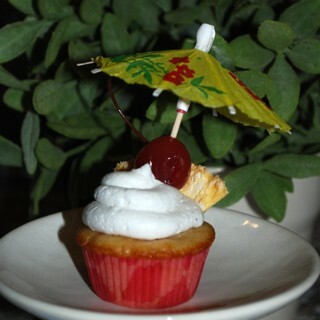 I try to have my cupcakes give the impression of the dessert that they represent. 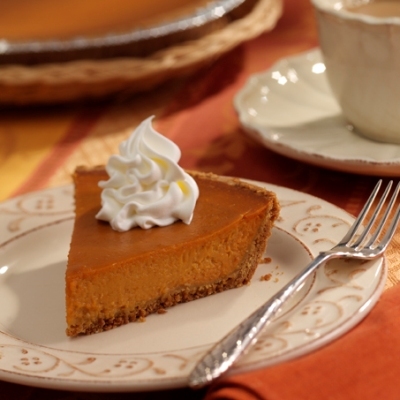 To me, pumpkin pie consists of a flaky crust and smooth pumpkin filling and massive amounts of whipped cream. Not a little dollop like this one…. I haven’t had much luck in the past with stabilized whipped cream AND I take my cupcakes to work where they sit on the counter all day waiting on people to eat them. I worry about whipped cream being left out of the frig all day. Some people might eat ice cream with their pumpkin pie, so I decided to do a vanilla Italian meringue butter cream since it’s a little ice cream-y. I started my task at the grocery store. 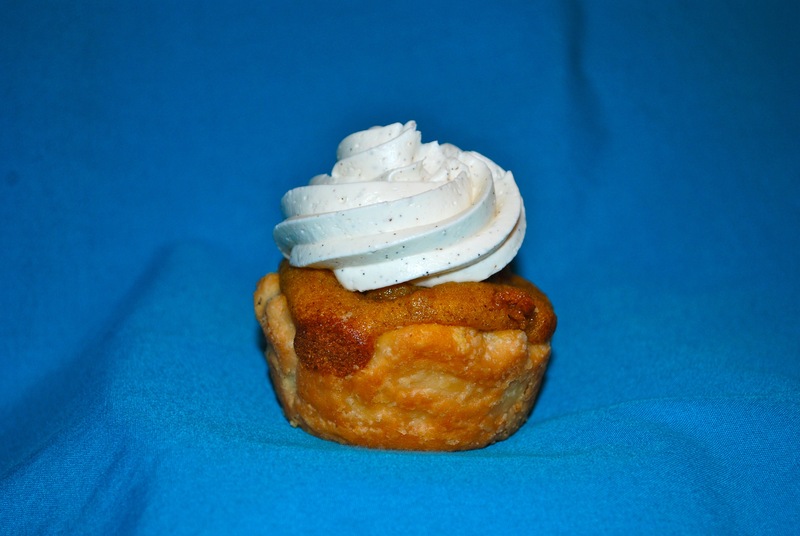 I’ve never been much of a baker in the first place…until my cupcake journey started…and I’ve NEVER been successful with pie crust, so I was hoping to use the refrigerated pie crust. Unfortunately, Pillsbury refrigerated pie crust AND the store brand both contain lard. While I can innocently believe that my eggs and butter come from well treated and happy cows, I’d be delusional if I imagined that the lard in this crust came from a sow who needed a little liposuction. I found one brand of frozen pie crust, Marie Callendar’s, that was made only with vegetable shortening. I left them out on the counter to completely thaw out while I worked on the custard. For the filling, I made traditional pumpkin pie filling by mixing together canned pumpkin, eggs, evaporated milk, pumpkin pie spice and sugar. I baked it for about 50 minutes at 350 degrees. While the filling was cooling, I worked on the crust for the cupcakes. I flattened the crusts and flattened a cupcake liner. 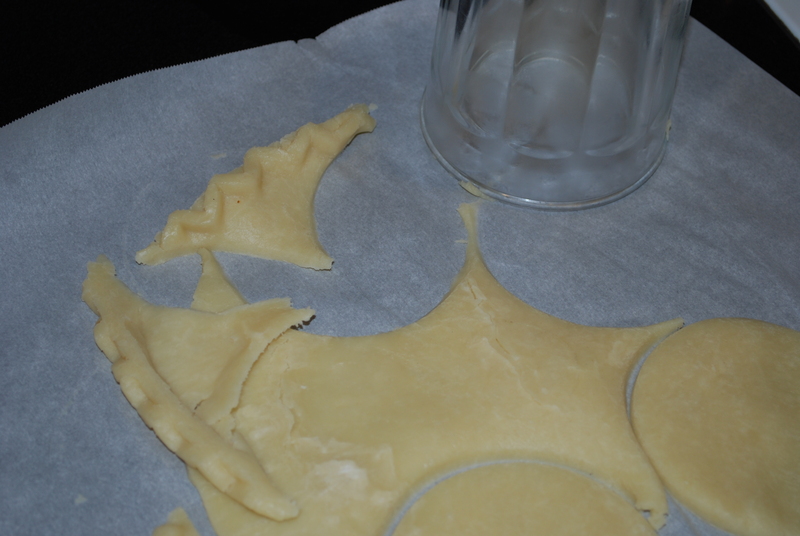 I used a glass to cut out circles of dough about the size of the liner. I balled the circles up, then pressed them out again between the liner and some plastic wrap. 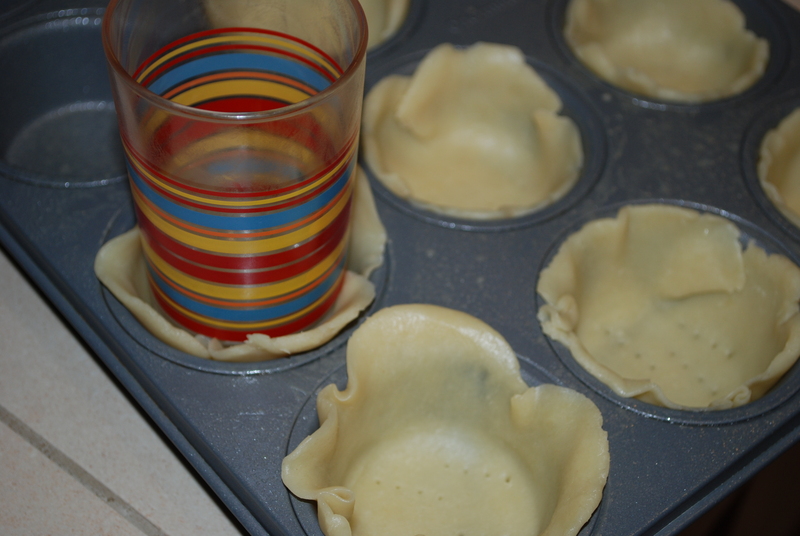 I used a juice glass to carefully press the circles into the cupcake pans. I poked a few holes in the crusts using a fork then baked them for about 10 minutes at 400 degrees. The custard was still a little hot, so I started on the icing next. 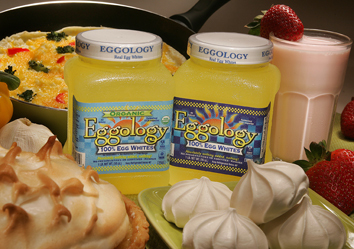 I normally use Eggology pasteurized egg whites for Italian meringue butter cream. I feel more comfortable knowing that they are pasteurized. Their website states that they are safe to drink raw (gross! 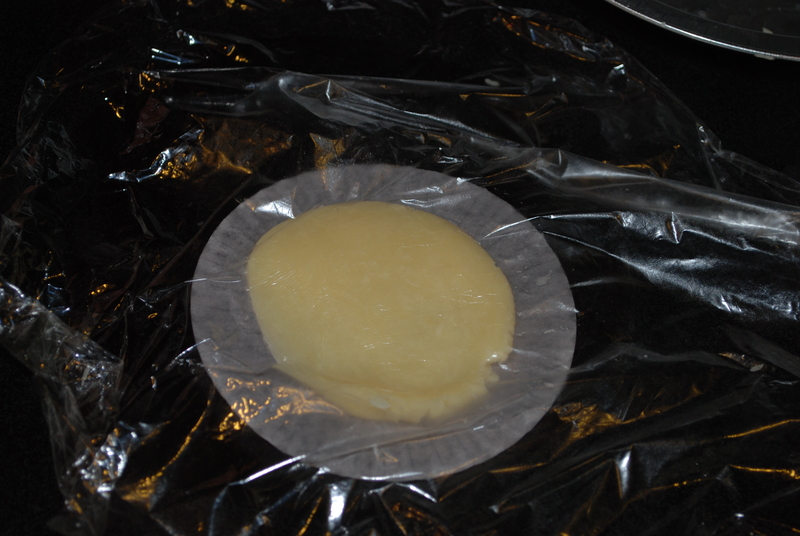 ), so no problem after adding boiling sugar syrup. QFC doesn’t carry Eggology and I didn’t want to go to another store, so I purchased another brand of pasteurized egg whites. MISTAKE! After 10 minutes of high speed beating by the Kitchen Aid, the other egg whites didn’t expand at all. They got a little frothy and white, but no volume increase at all. Next time, I will make the trip to Thriftway. Fortunately, I had exactly 7 eggs left: 2 for the batter and 5 for the meringue. I was a little nervous about using unpasteurized eggs for the icing, but measured the temperature of the meringue after pouring in the sugar syrup. The temperature passed 140 degrees, so I relaxed a bit. I only used 2 1/2 sticks of butter instead of 4, but I don’t think the butter cream suffered a bit. I flavored the icing using vanilla paste instead of vanilla extract because I was hoping for a more intense flavor and I wanted the flecks from vanilla bean. For the cake batter, I used a standard cake recipe, substituting pumpkin for milk and using 2 teaspoons of pumpkin pie spice for flavoring. In one bowl, I combined 1 cup AP flour, a bit of salt, 1 tsp baking powder, 1/2 tsp baking soda, and the pumpkin pie spice. In another bowl, I mixed together 2 eggs, 1/2 cup vegetable oil, 1 cup pumpkin, and 1 cup sugar (evaporated cane juice). For the first pan, I plopped a little batter in the crust then dropped on some pumpkin pie filling then smoothed the batter over. For the second pan, I plopped in a bit of pie filling first, then covered it with the batter. The latter method was easier. I baked the cakes for about 15 minutes on 350, then allowed them to cool enough to maneuver them out of the pans. For one cupcake, I used a tiny scoop to drop a tiny frosting ball onto the cake. Time crunch caused me to pipe it out of a bag, making the end result look like whipped cream instead of ice cream.